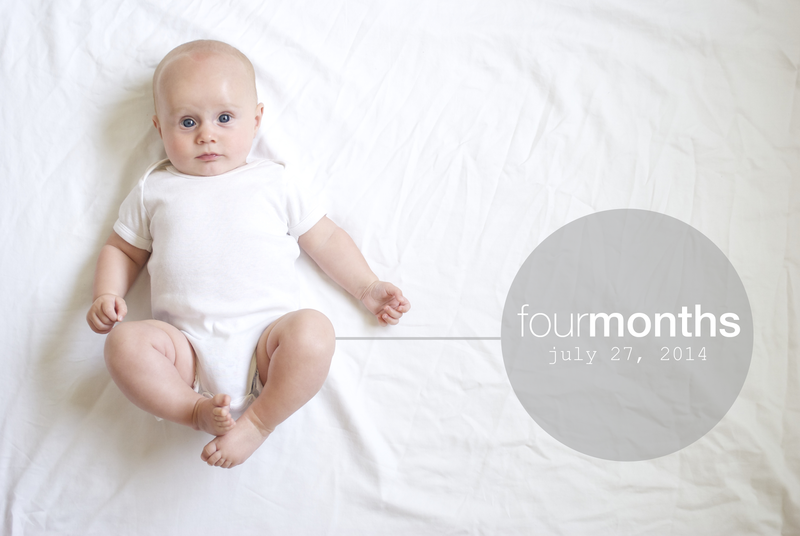 Every month I'm amazed at how much our tiny man is growing, although this month I feel like he's turned a new leaf. He smiles more than sleeps, plays more than eats, and coos more than cries. It's quite nice, if I do say so myself. - learned how to roll over from back to tummy, still trying to master it. - loves to snuggle everyone and everything. - not interested in rice cereal yet, so still exclusively breastfeeding. - hit a growth spurt and eats constantly, especially at night! - still wearing a size 2 diaper. - moved up to 3-6 months clothes (packing up baby clothes will never be easy!). - mastered grabbing and holding on to toys. - still loves to chew on his fists. - loves to watch Sadee play and smiles at her constantly. - discovered his voice - he chatters, squeals, and coos very loudly. - still working on developing a regular napping schedule, hopefully it will come soon. - is very, very ticklish. - loves to sit in the Bumbo. - participated in his first 5K on July 26 via stroller and sleep. Lucky fella! Cameron, one day you will tease me when you compare all of the letters I wrote to Sadee as a baby... and how you only have two at this point. Don't worry, you are not loved any less - time is just more sparse now. You, my boy, are my tiny little angel. Everything about you is soft and sweet and kind. When Sadee was a newborn, I never thought about her growing up or what she would look like as a woman. But with you, I can't stop soaking in all your tiny baby-ness because I know that one day you will be a man - tall and broad and strong. It's weird thinking of you that way, but deep down, I know that your learning and development now, will shape the way you are tomorrow. And though I want so much for you in the future - most of all I want you to remember how deeply you are loved and cherished. There will be days ahead that will be difficult for us, you will want your freedom, your independence, your own everything... but no matter what, you will always be my baby and I will hold on to these days where you need and want me constantly. Time goes too quickly my love. Let's stay friends. And let's always need each other. OH my goodness Kelsey! I LOVE your blog! Can't believe your a mother to two beautiful kids! wow how time flies! love you guys! and glad to know you all are doing well!